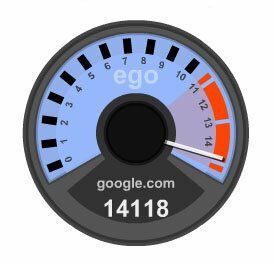 Eyeteeth: Incisive ideas: How big is my ego? How big is my ego? According to EgoSurf, pretty big. Just type in your name and the URLs of your blog or other pages you're associated with, and it'll search various engines, from Google to Technorati, and give you a ranking (I think it just means I'm the Paul Schmelzeriest of all the Paul Schmelzers out there, the most frequently cited). If you're really in need of ego massaging, you can subscribe to an RSS feed to be constantly updated on your ever-changing wonderfulness.